Will the fatal 4-way be gatecrashed by NXT's twisted sister? Last week, WWE announced that the top 4 female superstars of SmackDown Live, Mandy Rose, Naomi, Sonya Deville and Carmella will collide in a fatal 4-way match. The winner of that match will go on to face the SmackDown Women's Champion Asuka at the Grandest Stage of Them All, WrestleMania 35. The blue brand's female division has suffered a lot due to the triple threat RAW Women's Championship main event featuring two of SmackDown's top female athletes, Becky Lynch and Charlotte Flair. All of a sudden, the division looks much shallower, and the champion Asuka is left with no credible opponents. WWE was trying to build a rivalry between Asuka and Mandy Rose but the involvement of Sonya Deville has confused the WWE Universe. However, we are guaranteed to know Asuka's WrestleMania opponent next Tuesday and here are the four possible endings for the fatal-4 way #1 contender's match for the SmackDown Women's title. What if she wants to fight them all? Thinking practically, there's no female superstar on SmackDown as strong as Asuka. None of the 4 superstars have any sort of momentum heading into this match. While Mandy Rose and Sonya Deville have developed some issues amongst themselves, Naomi has been losing matches like she is a jobber. Carmella, on the other hand, never returned to the women's division after she entered #30 in the Royal Rumble match. She had been standing in R-Truth's corner since the January pay-per-view. 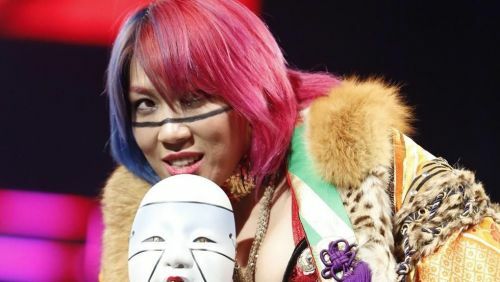 So, it makes sense to have them all challenge Asuka at WrestleMania 35. A fatal 5-way match for the SmackDown Live Women's title can deliver the goods if booked rightly and the first step in that direction is to have Asuka destroy everyone leading to a multi-woman match at WrestleMania.